There is just no stopping Voodoo from coming up with highly addictive arcade games. 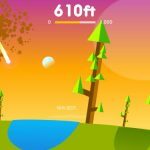 Ball Blast is an insanely new game from the French developer where you have to take out balls falling from the sky by using your trusty cannon. You will have to stop them from falling before they hit the ground. The problem is, they get bigger and tougher the further you progress in the game. You will need to upgrade your cannon in order to keep up with them. 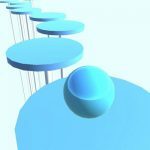 As you hit the balls, they will break apart into smaller balls until they disappear completely. You will earn coins depending on your scores. Use these coins to purchase different upgrades for your cannon. The more firepower you have, the better your scores will be. Don’t forget to check out our Ball Blast cheats, tips and tricks in order to get those top scores! As we mentioned above, the coins you earn while playing can be used to purchase upgrades. There are four upgrade categories that you can invest in: coin, fire speed, fire power, and offline earnings. The coin upgrade lets you earn more money from your runs. Upgrading fire speed and fire power increases your cannon’s fire rate and damage respectively. Obviously, offline earnings increase the amount of money you generate while logged off from the game. The category you should prioritize depends on your play style. For example, if you don’t get to play often, you can invest more in offline earnings. Since you need coins to purchase more upgrades, it only makes sense for you to prioritize upgrades that increase your income. Make sure you prioritize the two money-related upgrades over fire power and fire speed. Spend all your money on upgrading the coin and offline income categories until you feel like you cannot progress any further in the game due to lack of power. You should also choose to upgrade speed over power because having a faster fire rate lets you deal with more balls quickly. When your run ends, you will be given an offer to continue where you left off by watching an ad. Keep in mind that this is only available the first time you die in your run. When you die for a second time, you will be given another ad offer. This time around, it will be to double whatever you earned during that round. Make sure you take advantage of these two in order to maximize both your scores and your income. As you shoot the balls out of the sky, you will see coins drop on the ground. One thing you should know is that you don’t earn those coins until you actually run over them with your cannon. That means you should take time to roll from side to side in order to pick up the coins. Make sure you don’t get yourself killed while picking them up, though. The game lets you change the background in order to keep things interesting. The background you choose does not have any impact on gameplay, but it is fun to mix things up once in a while. You can play in a grassy meadow, on the beach of an island, or even up on the moon. If you are looking for something really unique, however, you should go for the skin you get with Play Tomorrow. This completely dark skin is the only one that interacts with foreground elements, changing the color of the explosions depending on the size of the boulder you just obliterated. Get your cannon and start blasting away in Ball Blast! Follow the tips, cheats and tricks listed above in order to get high scores! Do the different cannons you can purchase vary at all? I’ve unlocked about 7 of them and can’t really tell a noticeable difference except for the next to last one, with it’s small height, makes it seem a wee bit easier to move side-to-side. Waste of coins or helpful? Waste of Coins, The cannons are nothing but cosmetic. They are only for looks. I had this same question until i tested it out and discovered that they are only for the looks. I’m on 800+ level and now I’m changing my mobile so what is the method to get same game in other mobile? My wife with iphone has some balls with “?” symbol who gives some features (coins, double cannon, and so on). Why I haven’t on my phone android? I play on both (iphone & android) and I have the pink balls with “?” on both phones. I wonder what’s up with your. You have to update it so you’ll get it! I somehow have a negative coin balance. How did this happen? Can I make the bullets look different? Combining the shuttle with moon does but do any others have effects? Any idea how much is the top upgrade for fire power and fire speed ? I’m currently at $440k per upgrade. What’s the furthest level someone has gotten to? This “article” is rife with pure ignorance. – There is no value in investing in offline earnings. It will never return your investment. At 1480%, it costs another 410k coins to move up to the next level of earnings. At this current level, the max offline earnings is roughly 7.5k. At this rate, it will take almost an entire month of playing the game no more than a couple of times per day to earn back the 400k-ish coins it required to move to this level from the last one. If you add up the TOTAL cost of all of the upgrades to get to this level, it would literally take MONTHS of not playing to get this back. – “Prioritize money over power”. This is straight-up bad advice. As stated previously, the length of time it takes to get back your investment on the offline piece makes it completely not worth the upgrades. Putting your coins into speed and power upgrades earns you more points each time you play because you can destroy more balls. The occasional upgrade to the number of coins earned while playing can be helpful, but it should be the lowest overall priority. – “Continue after death”. Again, straight-up bad advice. If you’ve upgraded the coins you earn while playing, it is very common to be rewarded with large bonuses at the end of the round. Using an extra life and not completing the level you are in will almost never show you a large bonus of coins when you die. So, watching the video to continue play actually DECREASES your coin-earning potential. Plus, using the extra life to complete a round actually puts you in a worse position because you are not earning coins to purchase firepower upgrades (necessary for the Boss Fight levels – more later). – Roll over the coins. 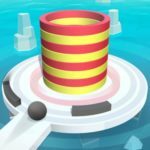 While true, it’s also important to understand that A) you have to roll over the bonus that falls when you destroy the mystery ball in order to activate it and B) you can’t remove your finger from the screen when you destroy the last bubble of a round or you won’t be able to still roll over the fallen coins that are there. – Unlock new backgrounds. Really? This is about driving up the score and yet it says outright that it has no bearing on gameplay. Why is this a “tip”? – One bonus at a time. If you roll over a bonus item while you have a bonus active, you will get both (or however many) at the same time. Some bonuses do not help you out in combination. For example, Freeze and Ghost don’t help each other. If you’re able to delay rolling over a bonus while you have one of these two active, you may actually fare better overall. Keep in mind the bonuses don’t stay forever. – Flashing means something is about to change. If you have the Freeze bonus, you’ll know the balls are about to start moving again when they start to flash. If you have coins that are about to disappear, they will flash and you should roll over them quickly to claim them. Same with bonuses. If your cannon starts flashing, it means that an active bonus is about to end. – Multiple cannons. While it would seem this should be a big bonus feature, I haven’t found them to be terribly useful. It can be slightly confusing to keep track of which cannon is the original when, especially if you have three or four of these active together. The good news is that a ball landing on a bonus cannon will simply deactivate it and not completely end your turn. – Boss Levels. Every fifth level (ends in 0 0r 5) is a Boss Fight. 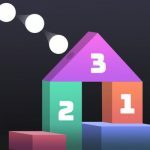 The level of challenge for each is wildly variable and you need to have the fastest, strongest firepower you can get in order to pass these levels. Boss Fights are pretty useless for earning coins, so you need to have all of your upgrades done (or coins amassed) before you get to one of these levels. – Prioritize your targets. Generally, the smallest ball on the screen is the one you should make your priority to destroy first. Follow it around until it’s gone. Balls start out larger and split into two smaller balls each time they are destroyed. Once it reaches the smallest allowed size for the game, destroying it makes it go away and drop coins. By focusing on the smallest ball on the screen at any given time, you are closest to completely removing a moving target from play. If you focus on larger balls first, you will ultimately end up with a screen FULL of targets / hazards and no way to avoid them. – Re-prioritize as needed. Sometimes, a much larger ball will enter the playing field but it will be green and have a relatively low number on it. Re-prioritize these types of targets because the total number of shots required to completely remove it and all of its smaller balls that will be created is much lower than that of the smallest balls with very high numbers. – Lead don’t follow. When shooting at a target that will bounce before you can completely destroy it, “lead” it across the screen and don’t follow it. By being ahead of the target when it bounces, it will then move INTO your stream of bullets and you won’t have to play catch up. – Don’t waste time watching videos for small bonuses. At the end of a round, you will get an opportunity to basically double the number of coins you earned in that round by watching a video ad. Keep an eye on how many coins it’s worth before deciding to watch the video. At the current stage of the game I’m in, I routinely will earn 1k-2k coins in a round but won’t watch a video for a bonus unless it’s worth at least 30k coins. Many times, I get 60k, 90k, or even 120k coin bonuses offered and I always take advantage of those. By skipping the 30 second video for “small” bonuses, I can get back to gameplay and rack up a much larger quantity in less time than the video would take. – Free upgrades. Watch your upgrade options before starting every round. The game will sometimes offer a free upgrade to one of the categories for watching a video instead of using coins. Take advantage of these when they’re available.